Come 25 July, and political parties will have to elect a new President of India. Hectic parleys have already begun amongst the Opposition parties to ensure that a consensus is reached for a common candidate who can take on the ruling dispensation, which is a little short of the majority mark. The BJP-led NDA controls 47.5% of the total 10.99 lakh Electoral College votes, while Opposition parties control the rest. One big worry for the NDA are the 2.5% votes that belong to the Shiv Sena. Despite being part of the NDA, the Mumbai-based party has not voted for the NDA candidate in the last two Presidential polls. And considering that the Sena-BJP relationship is on the rocks, the possibility of the Sena going its own way again is not being ruled out. In such a scenario, a united Opposition can deal a major blow to the BJP government at the Centre. If the Opposition does manage to unite, it could set the ball rolling for the the 2019 Lok Sabha elections. Ever since the Grand Alliance trumped the BJP in Bihar, like-minded secular parties have been pitching for a similar understanding to stop the Modi juggernaut. While the Congress and the Samajwadi Party managed to enter into an alliance for the UP Assembly polls, the BSP chose to go it alone, leading to the BJP emerging with a thumping majority. Since then, talks of secular parties joining hands has gained momentum. The Presidential Elections will be a litmus test as to whether the parties can shun their differences to field a consensus candidate. It is for this very reason that Congress president Sonia Gandhi is holding meetings with leaders of like-minded parties to work on a grand alliance of sorts. She has already met Bihar Chief Minister and Janata Dal (United) president Nitish Kumar and CPI(M) general secretary Sitaram Yechury. The CPI(M) Politburo has already taken the decision to support a consensus candidate if the Opposition can decide on one name. Meanwhile, West Bengal Chief Minister Mamata Banerjee is already in touch with Odisha Chief Minister Naveen Patnaik, who is already facing heat from a resurgent BJP, which has now set its sights on the state. On Friday, Banerjee was elected as the chairperson of the All India Trinamool Congress, and while addressing party workers, she slammed the BJP and urged all regional parties to come together for the sake of the nation. Even Delhi Chief Minister Arvind Kejriwal is likely to throw his weight behind a consensus candidate, considering he coined the slogan 'unite or perish' . RJD chief Lalu Prasad Yadav and NCP chief Sharad Pawar have also backed the idea of a consensus candidate. Sources say Opposition parties are likely to meet soon to discuss the issue and choose a candidate that appeals to all. Efforts to reach out to Akhilesh Yadav and Mayawati are also being made. The key question, however, is who are the front runners for the Opposition's choice as Presidential candidate. 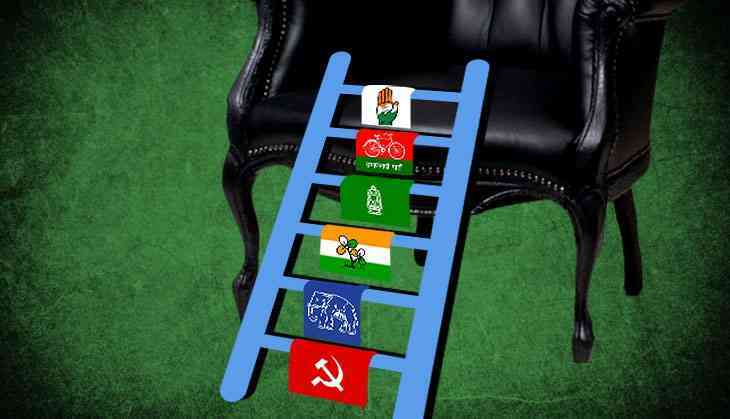 Among those who are being considered include JD(U) leader Sharad Yadav, NCP's Sharad Pawar, former Prime Minister Manmohan Singh, former Lok Sabha Speaker Meira Kumar and vice-president Hamid Ansari. Even incumbent President Pranab Mukherjee is being considered, but sources have informed that he is willing to contest only if Prime Minister Narendra Modi backs his name. In 2012, Mukherjee had defeated NDA's PA Sangma to become the 13th President of India, winning 7,13,763 votes. Back then, even the Shiv Sena had voted for Mukherjee, and considering his cordial relations with politicians, his candidature is not being ruled out either. Similarly, Manmohan Singh is yet another candidate who could garner support of Opposition parties, considering his long innings in politics and clean image. It remains to be seen whether Sonia Gandhi proposes Singh's, name considering the Opposition has asked her to take the lead in getting all parties together.